Saturday, August 10, the black and yellow (Goonellabah) descended on Byron Bay fresh from an upset victory over last year's Champions, Lismore Workers. 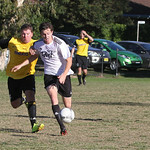 The reserves match began well, with lots of chances for Rams Steve Kirkpatrick, Tane Meek and George Martin. The first quarter was full of Byron's trademark speed and intensity but, as the game began to settle, no-one seemed able to find the net. Byron made the scoreboard with a deftly taken penalty from Kirkpatrick, but Goonellabah finally prevailed with well executed free kick and then a most unfortunate bouncer that left 'keeper Baynes hapless and helpless and the final score at 2-1 to Goonellabah. 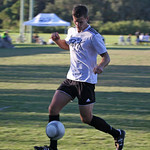 The Premier Division match began with even more promise with Byron firing right from the whistle. 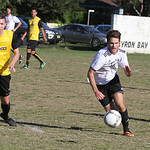 After a few less than inspiring performances in recent weeks, the return of star striker Sebastion Bell and midfield master Lachlan Dewar seemed to reinvigorate the entire squad. The result was an exhibition of first class football. The Rams' high-speed, precision passing, relentless attack and rock-solid defence had Goonellabah floundering from the outset. Wave after wave washed over the Goonellabah defence and the goal tally climbed to six for Byron by half-time. A successful free-kick and a penalty put Goonellabah on the board, but the second half saw the pounding continue with another three spectacular goals to the Rams. Sebastian Bell topped the goalfest with five outstanding goals, while equally fine shooting from Bruce Morhaus, James Tomlinson, Tom Inoue and Farren O'Brien took the final tally to 9 - 2. Thistles secured the minor premiership on Saturday and, with three matches remaining, Byron now has a pretty firm grip on second spot — and an eye on the Grand Prize come September. The next round is a catch-up against Lennox head at home on Tuesday evening. Reserves kick off at 6pm and the Prems at 8pm. 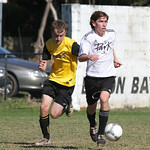 It's Byron's last home game in the general competition, so don't miss your chance to see local football at its finest.